wire) carry the signal over part or all of the communication path and the network is the totality of switches, transmission links and terminals used for the generation, handling and receiving of telecoms traffic. Wireless networks are rapidly evolving, and are playing an increasing role in the lives of people throughout the world and ever-larger numbers of people are relying on the technology directly or indirectly. The area of wireless communications is an extremely rich field for research, due to the difficulties posed by the wireless medium and the increasing demand for better and cheaper services. As the wireless market evolves, it is likely to increase in size and possibly integrate with other wireless technologies, in order to offer support for mobile computing applications, of perceived performance equal to those of wired communication networks. 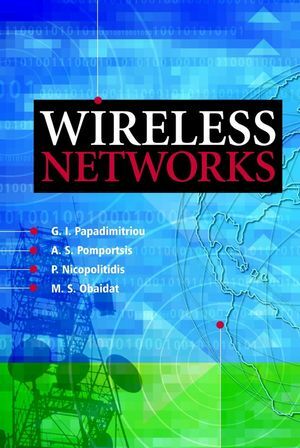 Wireless Networks aims to provide an excellent introductory text covering the wireless technological alternatives offered today. It will include old analog cellular systems, current second generation (2G) systems architectures supporting voice and data transfer and also the upcoming world of third generation mobile networks. Moreover, the book features modern wireless technology topics, such as Wireless Local Loops (WLL), Wireless LANs, Wireless ATM and Personal Area Networks (such as Bluetooth). Essential reading for Senior undergraduate and graduate students studying computer science, telecommunications and engineering, engineers and researchers in the field of wireless communications and technical managers and consultants. Georgios I. Papadimitriou is the author of Wireless Networks, published by Wiley. Andreas S. Pomportsis is the author of Wireless Networks, published by Wiley. Additional Materials Visit the site for powerpoint slides and electronic figures.